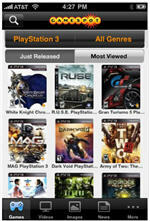 Check out the free GameSpot mobile application that gives you instant, on-the-go access to the largest games library on the planet. Get great GameSpot content, including images galleries, reviews, and news. Browse by platform, genre and more.